How about a Beretta M9A3 without the Desert Cerakote finish? 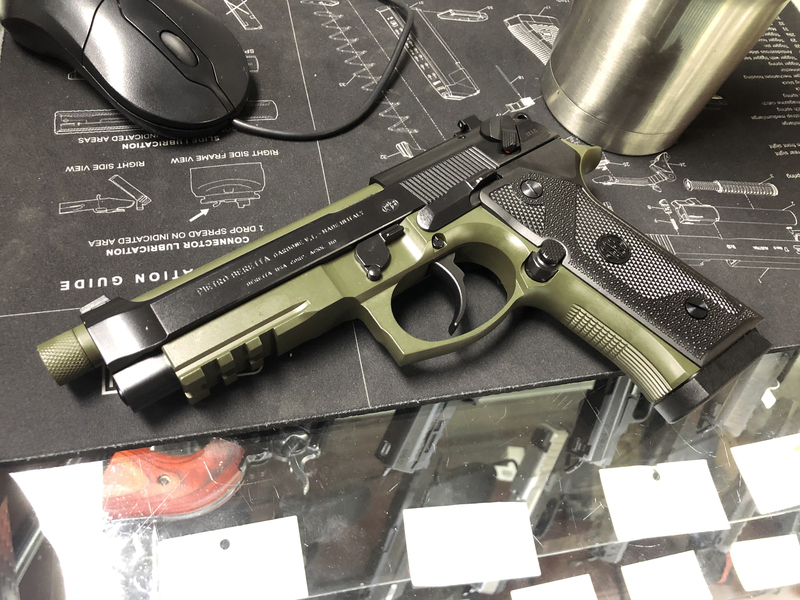 Thread: How about a Beretta M9A3 without the Desert Cerakote finish? Ok, where is your 92G Elite LTT? I think that might be my ultimate Beretta. If you can't win a gun fight against a lightly-trained individual during broad daylight with 88 rounds of 30-06, I'm not sure you'd be able to do it with... any other firearm. Ok, I've got an El Camino full of rampage here, so what's the plan? I should set up a gofundme for one. The M9A3 remedied all my complaints with prior models. I sent that Vertec off to Ernest Langdon. He did his Level 2 action job and tune up on it. It shoots amazingly sweet now. Seriously, it has the best trigger of any semi-auto I own. And I own a metric buttload of pistols. Did I mention the Beretta Elite II barrel I tracked down for it, so it prints even smaller groups? Oh yeah, I did that too. Also, I'll be in Ernest Langdon's TDA pistol class in October, just to torture Firefly some more. I'll be sure and post pics, too. And most recently bought the LTT elite with his trigger job. Finest da/SA trigger I have experienced. It is the finest out of the box/ off the shelf Beretta production/SSP ever in my opinion. And with night sights is a fantastic tactical pistol. And a “tactical elite” which is exactly this pistol with night sights and threaded barrel. Since that time we got the Brig Tac, which is a fine pistol but really is not optimized. The M9A3, which needed suppressor height sights, and many lean towards an elite or m9a1 frame vs the vertex. I don't know whether thank or curse you right now. I accidentally received that and regret not keeping it. You’re not wrong. It is in my opinion the best model available today, and one of the finest weapons I own. I told myself I was going to back of the throttle this year. Cull the heard and swap funds into ammo, mags and project completion. I really need to do this for mental reasons and streamlining. Like really really. Thank you though for making me aware.......I think. Do it. It was oozing with personality. I was en-route to claim it when I got the notification it had been shipped back. They are now making the M9A3 in black. It debuted at SHOT Show this year. I thought they released the black M9A3 last year. I’ve been seeing people posting photos of them on ARFCOM for about six months or longer. This year they announced a solid OD green M9A3, which people are reporting are already in stores. I have a photo but can’t post it at the moment. It looks great. I hadn’t considered buying an A3, but I may have to get one. I’ve seen multiple black ones in several LGS. I bought FDE because it had the G conversion already done. "Air Force / Policeman / Fireman / Man of God / Friend of mine / R.I.P. Steve Lamy"